- Minifig girls have small scale (1:38), moreover a minifig girl posing on a bike is … an epic fail. - In Bionicle, there are strong ball joints to build self-supporting figures even at scale 1:6, but because of their robustness, Bionicle parts are suitable to build rather masculine bodies only. One can see that almost anatomic level of poseabilty can be achieved (except at spinal chord, palm and wrist, see values written in red) in a fairly rounded body, if we give up self-supportability and use the smallest possible joints from TLG parts. - Julia, Sarah and Dominica differ only in haircut and fashion accessories. One can notice that different style haircuts limit head movement at different degree. Selecting coloring of TLG parts, we tried to avoid rare or custom colors. Using them, there are more degrees of freedom in dressing. Captured Amazon tribal fighters were deported from jungle to assigned locations safe distance from mining area – and mining personnel. 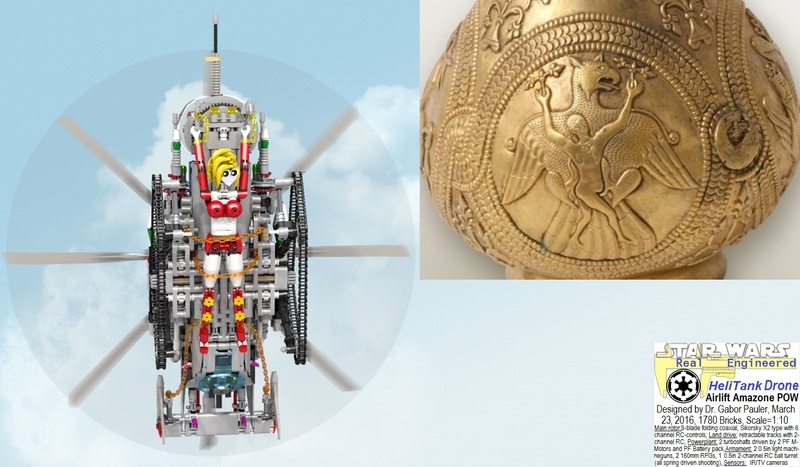 One can compare the scene HeliTank Drone airlifting Amazon POW with the scene depicted on Gold Vessel from Royal Treasury of Avaris from 650 a.d. Similarities are undeniable. Very late to the party, but great work on these, excellent poseability. I've been meaning to use the same part for the feet but couldn't figure out a way to integrate it. Quoting G stef Ah jeez, I remember seeing this on Brickshelf shortly after I'd posted my first version of an articulated LA ripoff! I think you're going somewhere but at the same time I think you're replying on too much Technic. The camwheels, for instance, make the figure somewhat unnecessarily asymmetric, and don't work well for articulation either due to the presence of the Technic axles. The hips, while allowing a little movement, don't allow for too much to happen either. It's good, but could go further! I'm also not a SM guy but I think better and more articulated Lego figures in smaller scales are something everyone can enjoy regardless. If you'd like I can post the .lxfs for my Absurde imitations or other MOCs. I wouldn't say they're the best either, but they are at least more articulated, and I always go through the effort with my builds to use existing colors of bricks. If you try using more System in figures, it may help with articulation and decor as well. Thanks for your critical comments. It is true that waist-hip rotation is the weak point of the current solution, but this problem is rooted back to thigh joints. I used here technic parts not by joy, but because I could not find any more compact solution with the sam e rotation angles. If you could send a link to your solutions, that would be great. 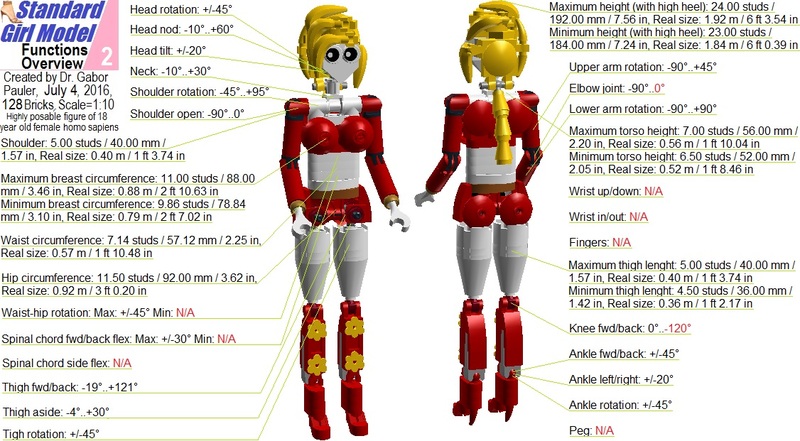 Also, it is true that smaller scale figure could have more wide audience, but I wanted to solve problem of a subgroup of MOCers who build large scale vehicles (just like me). Quoting Daniel Mayhew An engineering approach to the challenge! Excellent work, and thank you for sharing the details. Just, wow. Quoting Jeremy McCreary The recent breakthrough notwithstanding, you've been working up to this for a long time, Gabor. The only thing better than a pretty girl in a skimpy costume is an well-engineered one! Ah jeez, I remember seeing this on Brickshelf shortly after I'd posted my first version of an articulated LA ripoff! I think you're going somewhere but at the same time I think you're replying on too much Technic. The camwheels, for instance, make the figure somewhat unnecessarily asymmetric, and don't work well for articulation either due to the presence of the Technic axles. The hips, while allowing a little movement, don't allow for too much to happen either. It's good, but could go further! I'm also not a SM guy but I think better and more articulated Lego figures in smaller scales are something everyone can enjoy regardless. If you'd like I can post the .lxfs for my Absurde imitations or other MOCs. I wouldn't say they're the best either, but they are at least more articulated, and I always go through the effort with my builds to use existing colors of bricks. If you try using more System in figures, it may help with articulation and decor as well. An engineering approach to the challenge! Excellent work, and thank you for sharing the details. Just, wow. The recent breakthrough notwithstanding, you've been working up to this for a long time, Gabor. The only thing better than a pretty girl in a skimpy costume is an well-engineered one! Quoting Nick Barrett Skilfully done, it's so tricky to get a female body right! Skilfully done, it's so tricky to get a female body right!